We are delighted to welcome the worldwide first and one and only brand new Lagoon Seventy 7 for charter joining our luxury catamaran fleet in the West Med and Caribbean: S/Y JOY ! Luxury catamaran JOY scores with elegant modern curves, large hull portholes for plenty of natural light, a stylish interior, a spacious forward cockpit accessible via main deck, with its modern saloon, as well as its large flybridge, being the perfect raised social area for leisure, lounging, sunbathing and relaxing. 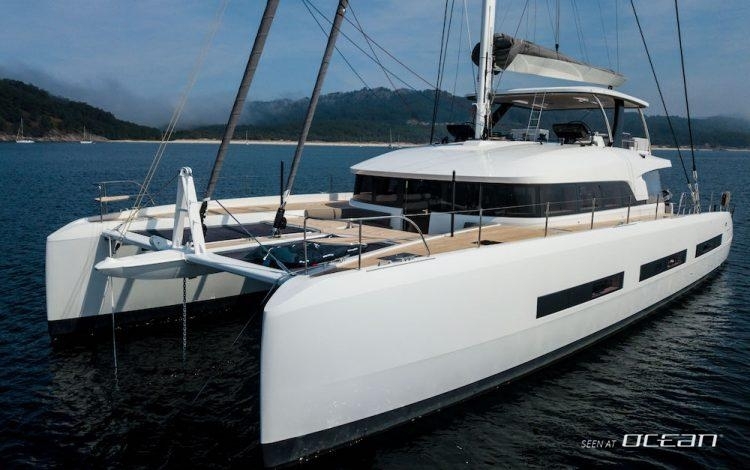 Penned by naval architects of VPLP, exteriors by Patrick Le Quément and interior design by who else than Nauta Design, charter catamaran JOY Seventy 7 incarnates the best the Beneteau Lagoon shipyard has currently on offer. Charter catamaran JOY boasts luxury and comfort we usually have seen at much larger luxury motor yachts. This leitmotiv is put to the fore when talking about special features like the hydraulic fold-down platform being a private sea terrace or beach extension. Ideal for sunbathing or launching water toys this outdoor feature is a real beach club. Once going up the elegantly elevating stairs guests onboard of JOY charter catamaran Lagoon Seventy 7 will find a huge promenade deck. The aft cockpit merges with the saloon which alone boasts more than 35 square meters, an own dining area with separate relaxation areas and settees. Alfresco dining will be a pleasure thanks to the fully-equipped outdoor galley with BBQ grill, and shelter is available under the large coachroof. The forward cockpit features a lounging area which is slightly lowered in comparison to the trampolines offering a better wind coverage but not forgetting about the panoramic sea views. Catamaran JOY for charter accommodates 8 guests in 4 well-appointed versatile cabins compromising a luxury master suite featuring with large ensuite bathroom, desk space, walk-in wardrobes and generous living area. In addition to that, the master stateroom also offers a direct access to the main saloon as well as to the cockpit and foredeck adding to the exclusivity of this unique layout. The other cabins include two VIP cabins as well as a twin cabin featuring own ensuite bathrooms. The crew is accommodated in two bow bunk-bed cabins having an own entrance via the deck to ensure guests' privacy. JOY Lagoon Seventy 7 catamaran comes with all features needed for pleasant stay onboard: air condition throughout, generator and water maker are on board as well ice maker, BBQ and LED-TV with Fusion Bluetooth radio CD/MP3-player. For entertainment, a variety of water toys is available including a fast 5m tender with 100hp, wakeboards, water-skis, stand-up paddleboards as well as several inflatables. Rendez-vous diving is also available and JOY luxury catamaran features an own scuba diving compressor with all snorkeling gear. Charter catamaran Seventy 7 should be your choice if you are looking for the ultimate sailing experience without compromises. Perfect to entertain families and couples this superyacht is inviting honeymooners and demanding sailors to explore the Caribbean and the Mediterranean the best possible way: with your own floating luxury apartment. Lagoon Seventy 7 JOY luxury catamaran is a true ocean-going bluewater dream yacht with world-cruising capabilities. Hurry up sending us your inquiries securing prime dates and special launching rates! Charter catamaran JOY Lagoon Seventy 7 has different charter rates for the Caribbean winter season. The rates are all inclusive at 64.200 USD for 8 guests (December to April) respectively 73.830 USD for 8 guests during Christmas and New Year periods. S/Y JOY Seventy 7 will be sailing French Polynesia in summer 2019. Send us your inquiries now to explore exotic and picturesque places in the Pacific like Tahiti and Bora Bora. Cabin configuration: 1 master (with king size bed), 2 double cabins (queen size beds) and 1 twin bed cabin, all with en-suite bathrooms. Air condition, generator, inverter, water maker, ice maker, Wi-Fi on board, LED-TV, radio CD/MP3-player, cockpit speakers, BBQ grill, swimming platform, stern/cockpit shower, sunbathing cushions, bimini, 220V/12V shore power, dinghy with outboard engine and all standard charter and safety equipment.